Serve these simple but impressive domino potatoes at your Easter dinner! 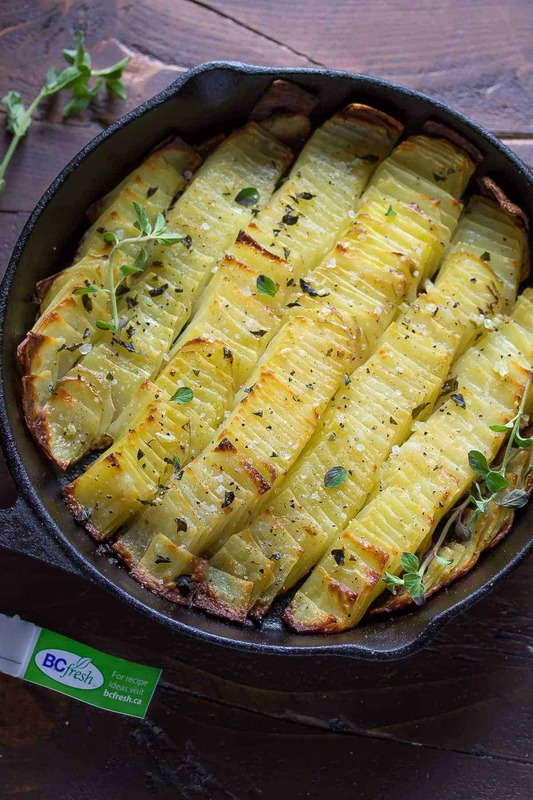 Thinly sliced potatoes are brushed with butter, sprinkled with sea salt and oregano, then baked to crispy perfection! Is it really that time of year already? Are we discussing Easter?! Somehow, yes. It is almost Easter! These days, holidays are a lot more fun. In previous (child-less) years, Easter was pretty low-key. But having a two-year old, Easter takes on a whole new meaning. Looks like we’ll be doing the whole she-bang: Easter egg hunt (one at home, one on a farm), brunch, and because we have family visiting, most likely dinner! It’s secretly kind of nice to have an excuse to really get into it! We won’t be cooking up a turkey or anything, but I know a lot of families do, and what goes better with turkey, or ham, or really anything, than potatoes? Today I am partnering with BC Fresh to bring you this recipe. I’m excited to work with BC Fresh, because I grew up on their produce, and it has always stood out in terms of freshness and quality. When I see the BC Fresh logo at the grocery store, I know I am picking up the best quality ingredient possible. Not only that, but I support local Canadian brands whenever possible. And let’s face it: in the Canadian winter, it can definitely be challenging to find Canadian-sourced produce. So when I saw the bag of BC Fresh Yellow Fleshed Nugget Potatoes, it was a no-brainer: you are coming with me! 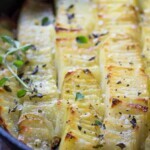 Today’s recipe can really be used with any small yellow potatoes. 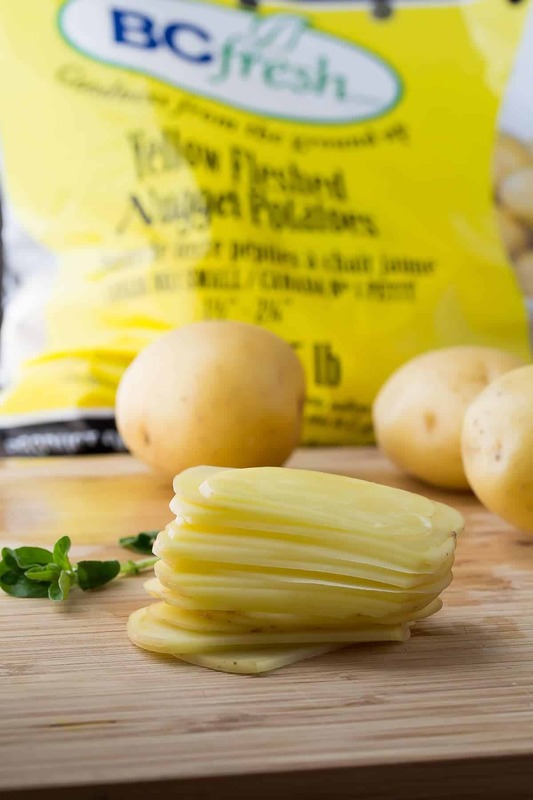 BC Fresh offers a variety of 1 ½” to 2 ¼” small yellow potatoes that would work fabulously in this recipe, so be sure to keep an eye out for them! So. It seems like you all like potatoes. Is that true? Because these Parmesan & Rosemary Potato Stacks were prettttty popular, as were these Cheesy Jalapeño Hasselback Potatoes. It got me thinking. We all just want to see new ways of serving up our favourite food, am I right? So today, I have yet another fun way to serve up potatoes: domino potatoes! Spread them out in a 9-inch cast iron skillet. Repeat. Brush with butter, sprinkle with sea salt and some fresh oregano. Bake away. The best part about these domino potatoes is that you don’t have to brush the butter in between each layer. That takes one heck of a lot of work out of it. And you end up with some show-stopper potatoes with crispy edges and soft insides! For more information on the availability of BC Fresh products, be sure to refer to their Availability Chart! Keep in touch with BC Fresh on Twitter, Facebook, Google + and Pinterest! Disclaimer: This post was sponsored by BC Fresh. Thank-you for supporting the brands that I love! As always, all opinions remain my own. 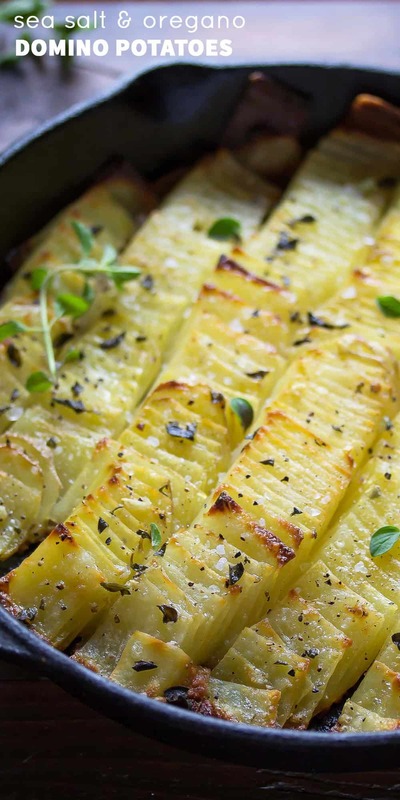 Domino-shaped potatoes are brushed with butter, sprinkled with sea salt and fresh oregano, then baked to perfection. Brush a 9-inch cast iron skillet with 1 tablespoon of the butter and set aside. Slice the very edges off of the potatoes, to make a cube. Then place on a mandoline and slice into 2mm (1/8 inch) thick slices. 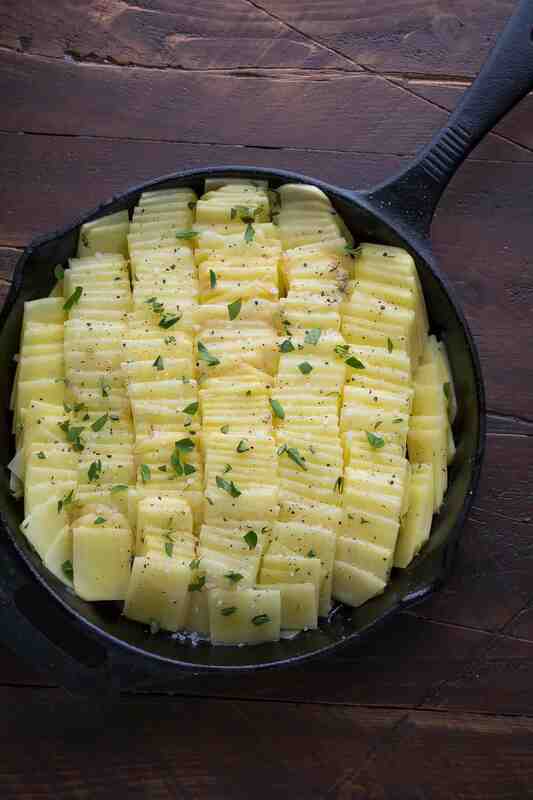 Arrange in the skillet, spreading the potatoes out slightly. Repeat until the skillet is full. Don't be afraid to pack the potatoes in tightly, as they will shrink during baking. Brush the potatoes with remaining butter (you may not need the entire 3 tablespoons), then sprinkle generously with sea salt and pepper, and the oregano. Bake for 30 minutes, then rotate the skillet. Bake for another 15-30 minutes, until edges are golden and crispy. If your potatoes are longer, you may wish to slice them in half to make two square-shaped sets of 'dominos'. The square shape bakes better. Totally forgot that Easter is coming up. Gorgeous! Wow! My mouth is hanging open. I love this presentation, Denise! Go mandoline! I was just telling Shawn that I am so excited for Easter next year when Josh will be old enough to kiiiind of understand the egg hunt. Holidays are so much more fun with a kid. Before, Easter was just kind of meh. Unlike these potatoes, which are WOW! So great! Potatoes are my FAVORITE and these look absolutely phenomenal! These potatoes are gorgeous! I love the domino style, they are going to be a hit at Easter! Yay for an Easter egg hunt too, Kai is going to have a blast! What a great side dish! I love potatoes as they are so versatile. Plus the sea salt and oregano? Right on the money! Simple ingredients but amazing flavors! Yum! oh wow these look amazing! You did a great job slicing them!! Thanks, Rachel! 🙂 It’s all about those crispy edges! Oh my heavenly goodness. These look AMAZING!! there is something about stacked up potatoes with lots of butter and crispy edges…YUM. Gorgeous photos as always!! He he…how can you go wrong with potatoes and a little butter? 😉 Thanks, Karen! 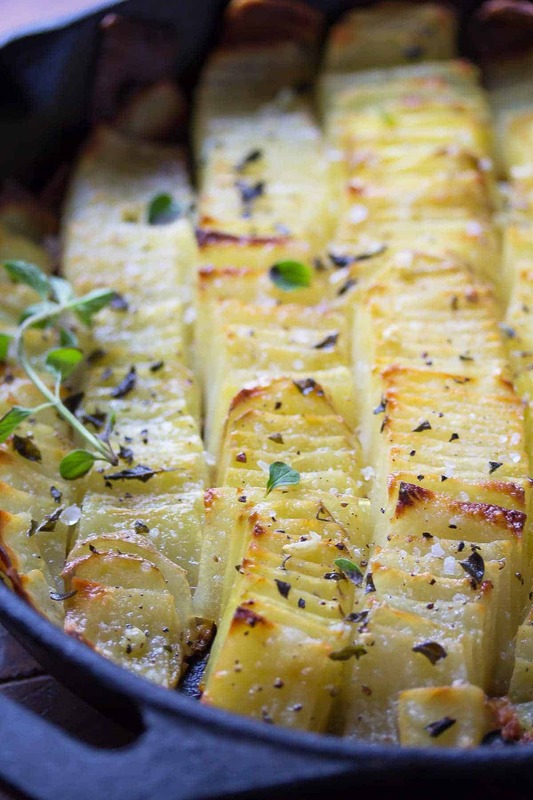 I love that domino look — this is a gorgeous potato dish, Denise! It really doesn’t get much better than a potato dish for the holidays, so these would be perfect for Easter! These are so simple and totally gorgeous! I am a BIG potato lover so these are perfect for Easter potlucks! Thanks, Ashley! They’d be great for a potluck! Love how simple and delicious this is, Denise! I could eat the whole thing by myself. And it looks so pretty, too! Don’t tell anyone, but I definitely ate more than I should have all by myself 😉 Thanks, Geraldine! As a kid, Easter was always my favorite Holiday. I loved hunting for all the chocolates and jelly beans! These domino potatoes looks really awesome, Denise. We always have a potato dish kind of similar to this at Easter dinner. I love the oregano in here! I think Kai is going to be pretty much in love with Easter when he finds out there is chocolate involved 😉 Thanks, Liz! These look so elegant! I just love potatoes, these look especially great! How pretty are these potatoes?? Haha I’m not sure I’ve said that before. I’ve never seen them “domino” style, but I just love them! The crispier the edges, the better! LOL I guess potatoes don’t exactly have a ‘pretty’ reputation 😉 Thanks, Alyssa!